Gio Pendant is a truly stunning piece. Gio shows today one of the most futuristic objects, a pendant with a unique "personality", capable to relate with the environment and to modify your perception. 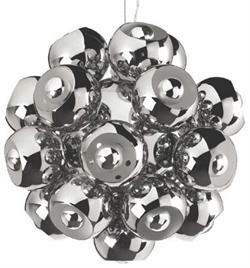 This exclusive fixture is made our of chromed metal body and chromed metal shades with white interiors.